The dark bags under my eyes which several colleagues remarked on last week have nothing to do with a no-excess-spared Christmas, or chasing after an 18-month-old who has discovered that most wrapped boxes contain a present for her for a fortnight. Or, indeed, long miles travelling to relatives while my wife battled through a stomach bug. No, those bags are entirely due to the book on the right here. You know when you think you don’t have time to read, then start reading a book when you get chance and then everything else that can be put to one side tends to go that way? This is one of those books. Gathering String is a “political intrigue” with “believable characters and … authentic voices,” says one of two recent reviews on Amazon. “I highly recommend this first novel and look forward to more pleasing diversions from Mimi Johnson,” wrote “Angela_says” in a 5-star review. A top-notch suspense/mystery novel whose author is a lovely lady I met once at a tweetup in Cedar Rapids. 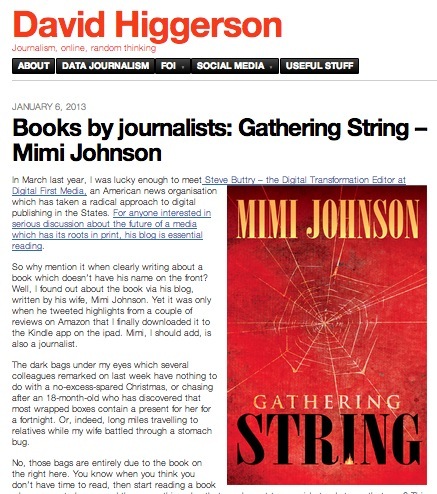 Hubbs gave Gathering String 5 stars in a Good Reads review last spring. I enjoyed this story from beginning to end, even during an election year! Finally getting into @mimijohnson‘s Gathering String. Only 30 pages in. Already hooked! At the point in @mimijohnson‘s Gathering String that I’m OK w/my kid destroying my house so long as I can get through just one more chapter. @mimijohnson Got your book for Xmas!Hooray!! The novel was published as an ebook on March 18 and had more than 10,000 downloads in 2012. The electronic version is sold through the Kindle Store, but you don’t need a Kindle to read it. You can read it on the Kindle app for tablets, smartphones and computers. The paperback edition came out Aug. 8. Mimi Johnson promoted the book in bookstore, library and book club appearances in Iowa and Ohio in October. The book has been rated more than 50 times on Amazon and Good Reads. Both places, the most frequent rating is 5 stars (on a 5-star scale). The overall rating is 4.7 on Amazon and 4.15 on Good Reads.